Crochet-a-long with @sugarbeecrafts and @733blog, you in? I’m trying hard to use the materials I have on hand for a few reasons. The first being that I have so much and it’s become a little intimidating. The second and equally if not more important, the more I use the less I have to move when the time comes. I found this Crochet-A-Long and decided that this would be a good push to get through some materials. Project Crochet, a crochet-a-long hosted by Kim of 733 Blog, Heather of Twin Dragonfly Designs, and Mandy of Sugar Bee Crafts, is on like Donkey Kong. I don’t have big projects to do, but I have enough small ones to keep me busy for the month and beyond. It’s a good month for it. Sure the Olympics are on, but that doesn’t take any real focus from me. And we’re going on a road trip. I like a challenge and I’ll try to stick this one out. Saturday, I posted one of the projects as part of Saturday Morning Command Center which I ended up finishing over the weekend. Now to decide which of my little friends turning 6 it will go to! 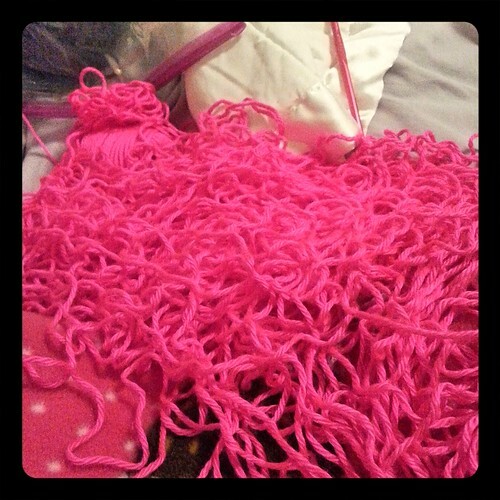 The pink yarn? Got wrapped back up into a ball for now. It’ll speak to me and tell me what it wants to be. This entry was posted in crochet and tagged busy hands, crochet-a-long, nothing on tv that needs my focus, project for road trip, projects. Bookmark the permalink.